Track all of your daily activities in the Argus iOS app, including nutrition, workouts, and so much more. Discover fitness insights about your body type and what common sports injuries you are more prone to having, such as ACL injury and achilles tendinopathy. Based off of your genetic results, home workouts will be customized to your injury risk and optimized for maximum weight loss. Achieve your wellness goals with workout and diet plans customized to your DNA, and connect with others in the Argus community. Available exclusively on iOS. Discover the bigger trends in your life, and quantify your day-to-day with Argus: DNA + Premium for iPhone and iPad. Argus tracks your steps, calories, meals, hours of sleep, and more to motivate healthy behaviors in nutrition and fitness. Now, it’s even more intelligent with genetic insights. Once your results are available, your DNA is translated into actionable recommendations that range from establishing new nutrition goals to customizing your workout routines. To get a good baseline for your current habits, log your food and exercises for a week in the Argus app. Once your DNA insights are available, see how they affect your daily habits and track your improvements over time. With your purchase, get a year full of premium access to the diet and workout plans in the Argus, Calorie Mama, and Fitness Buddy apps available for iPhone, iPad, and the iPod touch. Download Argus now to start tracking your behaviors. Azumio’s suite of DNA + Premium Subscription products checks your genetic predisposition to food and nutrient tolerance, injury risk, and more to customize your wellness recommendations. Your ability to digest dairy products without side effects such as abdominal discomfort. Argus keeps this mind and provides a lactose-free meal plan. Your ability to digest gluten. If you find that you are sensitive to gluten, Argus provides a gluten-free meal plan for your dietary needs. The effect saturated fat consumption has on your bodyweight. If saturated fat significantly increases your bodyweight, Argus provides recommendations to help reduce your intake of saturated fat. Your ability to process omega-3 fatty acids, an essential nutrient. If you are predisposed to having lower omega-3 levels, Argus recommends diets to help you increase your consumption of foods high in omega-3 fats. The effect of genetics on your iron levels. Argus provides recommendations on iron intake if you are predisposed to below-average iron levels. The speed at which your body breaks down caffeine. Argus allows you to track caffeine intake so you can see how it might be affecting you. Whether your face is likely to flush red when you drink alcohol. Argus allows you to track your alcohol intake so you can see how it might be affecting you. Your predisposition to experiencing an ACL injury. Argus adjusts your workouts to eliminate exercises that require rapid stops or direction changes. Your predisposition to achilles injuries. Argus adjusts your workouts to eliminate exercises that put stress on your calves and heels. Your predisposition to stress fractures. Argus adjusts your workout to eliminate exercises that are high impact in nature. Your predisposition to arthritis. Calorie Mama adjusts your steps goal, bodyweight goal, and workouts to reduce arthritis risk. Your predisposition to being able to perform power activities and endurance activities, and your predisposition to having high or low muscle strength. How drinking sugary beverages affect your risk of having a higher BMI. Know what it means for your body when you drink your next soda or cup of sweetened coffee. Your predisposition to having higher or lower blood triglyceride levels. If you’re likely to have higher triglyceride levels, suggested recipes will be limited in fats and sugars. When you buy Argus: DNA + Premium subscription, you get access to all of Azumio’s Helix-powered apps: Argus, Fitness Buddy, and Calorie Mama. 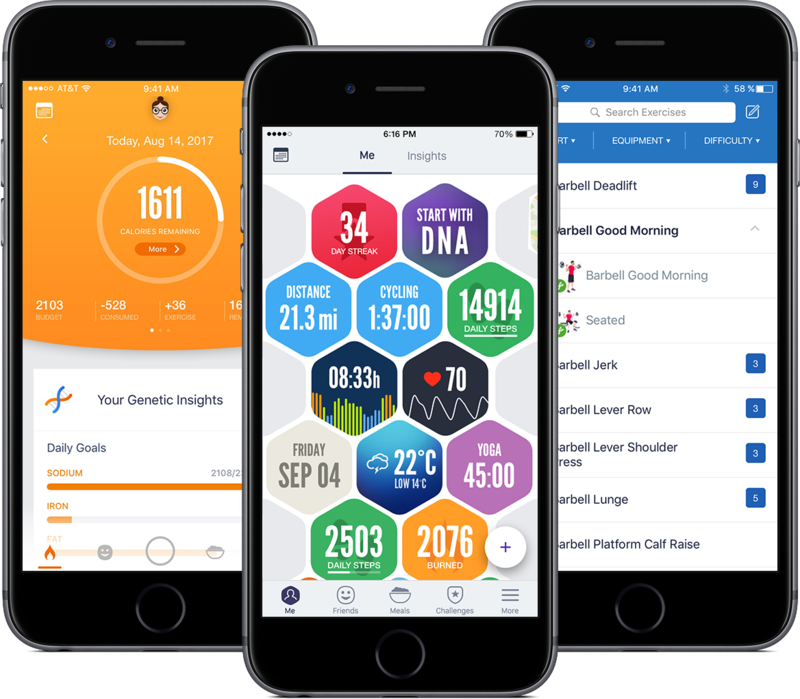 Each app will provide the same genetic insights, but the apps focus on different aspects of your nutrition and fitness journey. Reach farther with DNA + Premium, and get deeper insights that can help you meet your health goals. Genetic variants related to fitness and weight loss are connected to the way that your body processes food and responds to exercise, but they do not guarantee that you will or will not be successful with any given diet or excercise plan. Your physical fitness is largely determined by how often you exercise, the type of training you do, your body type, and your diet. Your DNA may help you narrow in on new diet and exercise plans or diets and exercises that you might prefer or find more successful than others, or that give you a better understanding of your existing preferences. Everyone, regardless of their genetics, will benefit from a well-balanced diet and increased exercise. Results do not determine or limit your ability to gain or lose weight or perform different exercises. Our understanding of how genetics influences nutrition and fitness will improve with more research. Order Argus: All-Access Premium and Helix sends you a DNA collection kit, which includes everything you need to get sequenced. After Helix sequences your DNA from your saliva, you’ll get an email from Azumio to view your results when they’re ready. Azumio uses machine learning and computer vision technology to improve healthy behaviors in nutrition and fitness. Founded in 2011, Azumio has developed mobile applications for calorie counting, heart rate tracking, sleep analysis, physical fitness, and diabetes health management. Adding genetic insights enables us to develop sustainable nutrition and fitness plans that are personalized to each person’s need. Azumio works with clinical research scientists at Stanford University and at the University of California, San Francisco. Yes. To see your Argus: DNA + Premium Subscription results, you’ll need an iPhone, iPad, or iPod touch running iOS 8.0 or later. Does Argus contain any nutrition features? Argus has a built-in calorie counter that recognizes over 100,000 food items. Argus also provides 11 meal plans ranging from keto to paleo diets to help you eat better. Does this product include access to Calorie Mama or Fitness Buddy? Argus: DNA + Premium Subscription includes all of Azumio’s Helix powered apps. Gaining access to Argus: DNA + Premium Subscription provides access to the DNA results and content in the other products. Use the same login account across all of Azumio’s Helix powered apps. How long do I get access to the Argus: All-Access Premium? You get a year of premium access to your DNA insights with your purchase. Yes. In order to use Argus: DNA + Premium Subscription, you need to be sequenced by Helix. To ensure the quality and accuracy of the genetic information used for this service, products in the Helix marketplace do not accept genetic data from outside sources. And, once you’ve been sequenced by Helix, you can purchase more DNA-powered products from a variety of categories like fitness, nutrition, entertainment, and more—all without having to get sequenced again. How does Helix provide my DNA information to Azumio? Is it shared with anyone else? Your DNA information is stored securely by Helix. When sequencing is complete, Helix only sends the relevant DNA information needed by Azumio to generate your results. We do not share your DNA information with anyone without your permission. We always maintain high standards when it comes to the security and privacy of your DNA information. How do I learn more about how Azumio uses my information? Azumio will send you an email when your results are ready to be viewed online. To cancel your subscription, please contact Helix.